Sea-Doo vs. Yamaha vs. Kawasaki — Which PWC Is Best? It’s a years-long debate: which jet ski brand is best? The top three — Sea-Doo, Yamaha, and Kawasaki — all have marketing materials and informational resources designed to sway your opinion towards their products. How can you properly evaluate your options? These machines aren’t cheap, so you’ll want to choose a jet ski that you can enjoy for years to come. If you’re new to personal watercraft, shopping can be even more confusing. There are different categories at different price points (ranging from $5,399 to $17,999), each with its own advantages and drawbacks. While we could write a short book comparing each model from each manufacturer, this guide will give you an overall view of the jet ski landscape and help you decide which one is right for you. All the major personal watercraft brands offer jet skis in a variety of categories which feature products that are designed for particular purposes. There are five total categories (although not all brands offer options in each category): rec-lite, recreation, tow-sports, luxury, and performance. Before we look at the different brands, it’s important to understand the characteristics of each jet ski category, so you know which you should start looking at first. This category is relatively new to the scene, created with Sea-Doo’s introduction of the Spark in 2014. Rec-lites are the economy version of personal watercraft, starting at $5,399 and going up to $8,699. Rec-lites can handle speeds between 40 mph to 50 mph, which will seem plenty fast to beginners. 2-seater and 3-seater versions are available, and they make an excellent choice for first-time buyers who are just starting to explore the world of jet skis. Yamaha recently entered this market with their 3-seater EX, creating competition for Sea-Doo. Kawasaki doesn’t have a product available in this category. This category is probably the most popular. Most rentals are recreation-category jet-skis. These personal watercraft are more stable than the rec-lites, while simultaneously offering similar nimbleness. Each brand offers multiple products in this category. Sea-Doo’s lineup includes the GTS, GTI, GTI SE 130, GTI SE 155, and GTI Limited 155. Yamaha has the VX, VX Deluxe, VX Cruiser, VX Cruiser HO, and VX Limited. And Kawasaki offers the STX-15F and Ultra LX. Recreation-category watercraft have top speeds ranging from 42 mph to 62 mph. They have better storage options than the rec-lites, and they make fantastic jet skis for families. Sea-Doo owns the tow-sports category right now, with two different models to offer: the Sea-Doo Wake 155 and the Sea-Doo Wake Pro 230. These personal watercraft are designed for people who enjoy pull sports like tubing and wakeboarding. The Wake 155 is built for hobbyists, while the Pro 230 provides more stability and a more powerful engine that can handle speeds up to 60 mph. The Wake 155 isn’t much cheaper than the Pro version ($11,999 vs. $14,699) — we recommend the Pro, which has a better seat and engine. The luxury category is ideal for those who’ve tried jet skis at lower price points and are ready for something that’s more comfortable with more power. 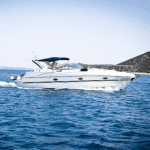 This category contains the watercraft with the largest engines on offer. The speed of these watercraft tops out at the Coast Guard’s max of 65 mph. Price — you pay for the extras you get in this category. First-time buyers (or most people, for that matter) don’t really need to consider a performance personal watercraft. This category is really designed for those who want to race their watercrafts. If you override the speed controls (which voids the warranty), these machines can hit up to 80 mph in as fast as 3 seconds. Those who buy performance jet skis have spent a lot of time on them and are ready to commit to take their sport to the next level. Due to the fact that these machines have excess power that isn’t needed unless you’re racing, we recommend that folks wait until they’re highly experienced with personal watercraft before considering this category. One of the biggest advantages of Sea-Doo’s products is their pricing. There’s a reason this brand is so popular with first time buyers. It’s a great choice for those looking for a fun jet ski to start enjoying the water with. One thing you’ll need to keep in mind with Sea-Doo is that the low price is made possible because their base models are lacking key upgrades that you’ll probably want to make at some point. By the time you pay for the upgrades, their pricing is more in line with Yamaha (although still a bit cheaper, generally). Sea-Doo is an innovator, and if you want specific features on your jet ski for particular uses like pull sports, this brand will be your only option. The Spark Trixx is a perfect example — it not only is affordable, it’s also specially designed for performing tricks. Yamaha’s strength is their engines — they perform well and seem to last forever. They’re also simple to work on, if you’re interested in doing your own maintenance. Although Yamahas cost a bit more than Sea-Doos, the maintenance costs saved by doing your own work can reduce the difference. This brand is also known for fuel efficiency. Not only does this save money, it also prevents you from having to pause the fun to refuel. Another advantage of Yamaha is their safety features. Most jet skis don’t have rudders, so they must be moving forward for you to make a turn. Yamahas will turn without acceleration. They also have an excellent braking system that brings the watercraft to a stop smoothly. For this reason, Yamahas are a great choice for families with children. Kawasakis are the highest price of any of the brands, but they do offer features that the other two don’t, such as built-in speakers and heat-resistant seats. There’s no right or wrong when it comes to Sea-Doo, Yamaha or Kawasaki jet skis. Which one is best for you will depend on your own needs, desires, and individual situation. We recommend starting your personal watercraft shopping journey by deciding which category most appeals to you and then evaluating the products that are available in that category. If you’ve narrowed it down to a couple of models but they’re lacking something you can’t add on, consider going up to the next category. How often are you planning to use the jet ski? Are you looking primarily for speed? The ability to do pull sports? To perform tricks? Just general fun? How long do you plan to be out? Will you be bringing items along that will require storage? Is initial cost or lifetime cost more important to you? Do you want to upgrade and customize your watercraft over time, or do you want your bells and whistles up front? How will you handle maintenance? How will you transport the watercraft? How will you store it? Will you need a jet ski cover? Don’t forget to talk to your insurance provider about insurance for personal watercraft! Jet skis are a fun way to enjoy the water. Most people who try them can’t wait to get back on one! If you can envision the specifics of how you’ll be using your new personal watercraft, you’ll have a good idea of the type of jet ski you should buy — not only the brand but also the model that’s best for you. Each brand and model has its own advantages and trade-offs, so take your time and make the decision that’s right for your own needs. If you’re new to jet skis and looking for more resources on how to get started and what you should know before hitting the water, check out this comprehensive beginner’s guide. It outlines essential and recommended equipment, plus safety tips you’ll want to know. It also shares tips on steering, driving, braking, docking, and loading, as well as other information to maximize your enjoyment of your new personal watercraft. Welcome to the wonderful world of jet skiing!